Hello! 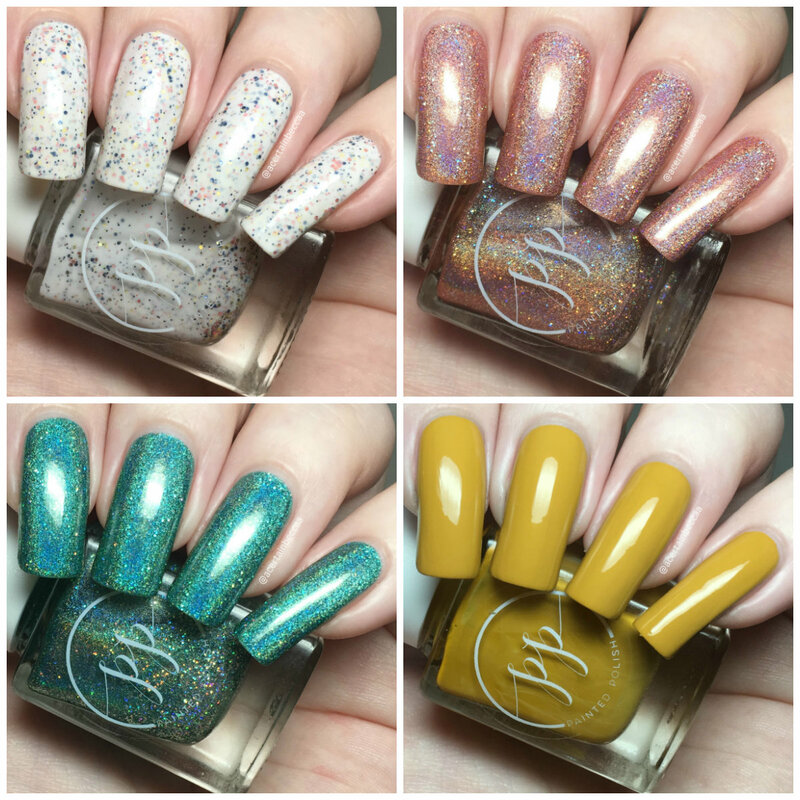 Today I have swatches of some of the Painted Polish beauties I picked up at Polish Con Chicago in September. I have lots of love for Lexi's creations, and I couldn't resist a splurge with her buy 5, get 1 free deal. 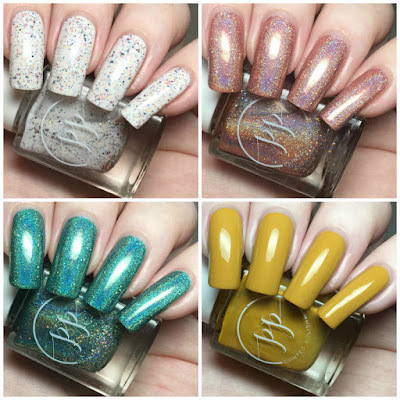 I picked a variety of polishes, four of which I have to show you today. I would have included all six but I don't have access to most of my nail stuff at the moment, and I've had these ones ready for a while. Lets get on with the swatches! 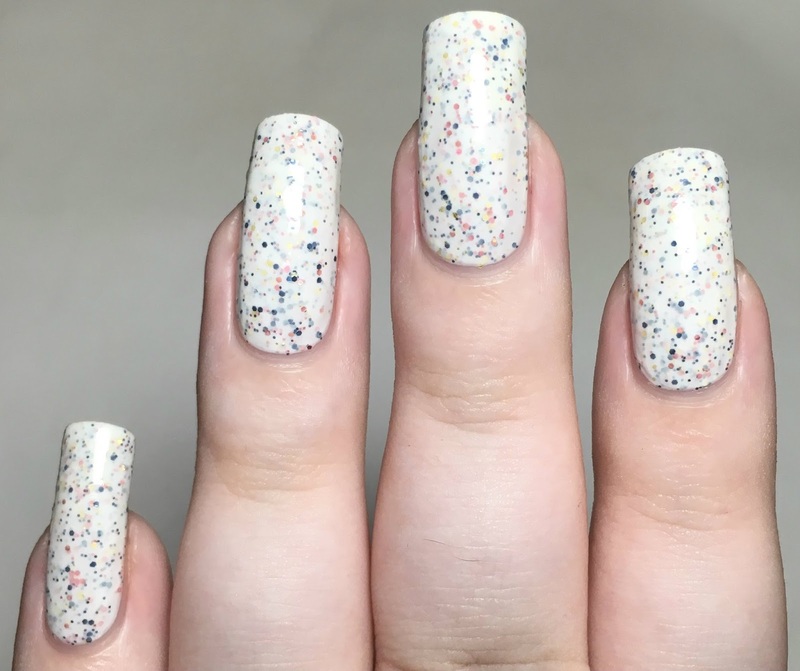 'Sideshows & Snowcones' is a white crelly with pink, navy, and gold microglitters. This polish and the next are from the Midway Merriment Trio debuted at Polish Con. The formula is smooth and easy to apply, and builds up nicely. I did have pretty much full coverage in two coats, but I often add a third with white crellies just to make sure. Below is three coats with topcoat. 'Carnivals & Cotton Candy' is a rose gold holographic with added silver holographic microglitters. It has a smooth and easy to apply formula. This does start off fairly sheer, but builds up nicely. I could just about see my nail line after a second coat so added a third. Below is three coats with topcoat. 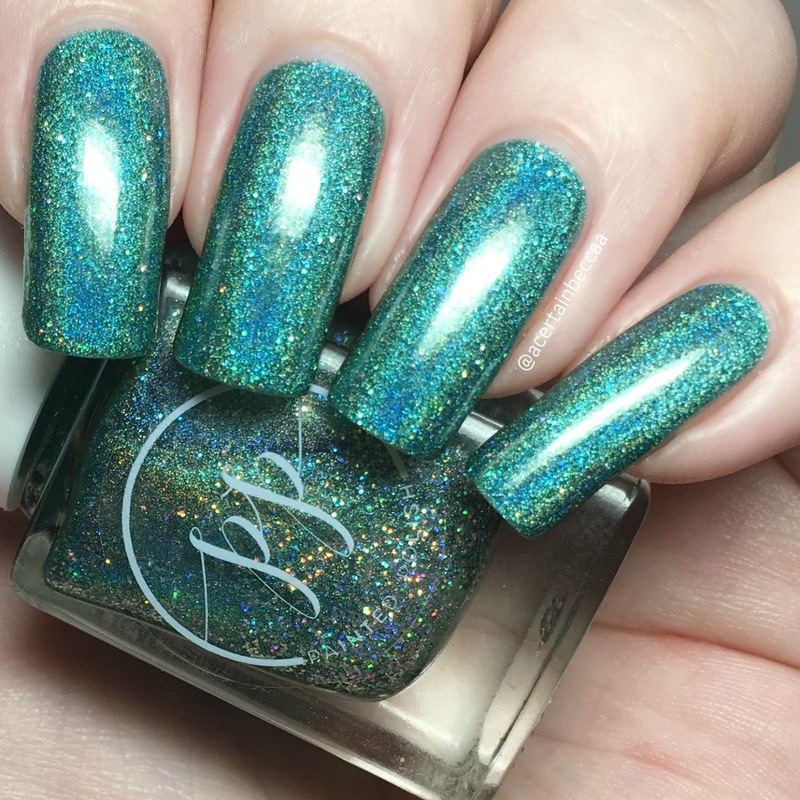 'Yo-Ho-Holo' is a teal ultra holographic with added silver holographic microglitters. I have to be honest and say I picked this up largely for the name, although it is gorgeous! It is smooth and easy to apply, and builds up in two coats. Below is two coats with topcoat. 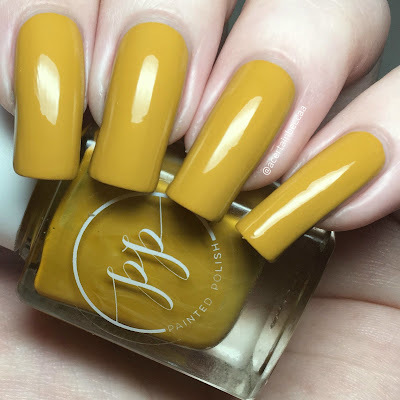 'Stamped in Mustard' is a mustard yellow creme that, as suggested by the name, also doubles as a stamping polish. 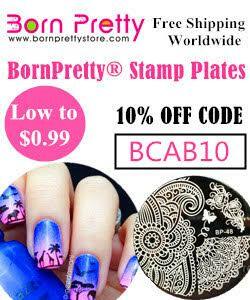 It is slightly on the thicker side to ensure that it stamps (and it does so perfectly, I've used it numerous times! ), but is smooth and easy to apply. If careful, this is a one coater. Below is one coat with topcoat. What do you think? 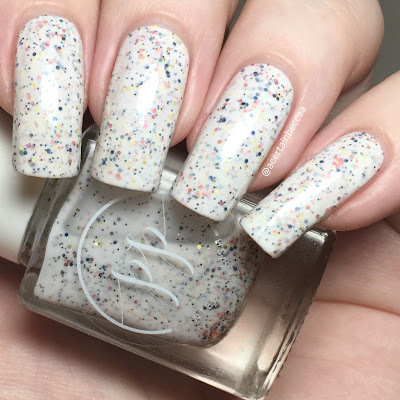 Are any of these polishes you would have picked up yourself? I love all four, but I have easily used 'Stamped in Mustard' the most so far. 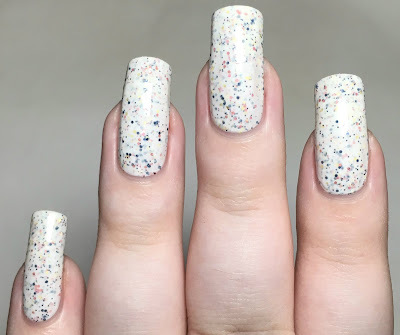 I'm currently obsessed with Lexi's cremes and they are always my go to polishes for stamping. I do wish I'd picked up some more! All polishes mentioned except 'Sideshows & Snowcones' are available on the Painted Polish website now. 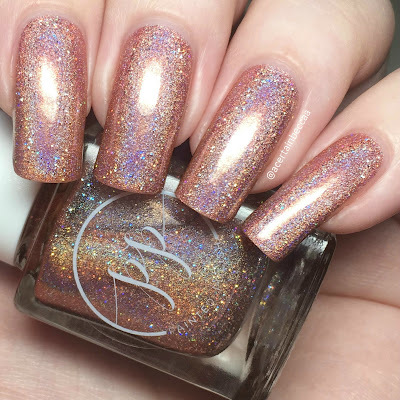 Both 'Sideshows & Snowcones' and 'Carnivals & Cotton Candy' are in stock on Rainbow Connection here.